PITTSBURGH (AP) -Sidney Crosby, widely recognized as hockey's top player, might not be able to argue he's the best on the Pittsburgh Penguins when he returns from a lingering ankle injury. Evgeni Malkin and Petr Sykora each had two goals and two assists, and the Penguins again had plenty of offense even without Crosby, beating the slumping Philadelphia Flyers 7-1 Sunday. "That's what you need when your top guy goes out," said Ryan Malone, who had two assists while skating with Malkin and Sykora. "There's no reason when Sid comes back that we can't have the same desperation, the same attitude. He's just going to add to us." Crosby, the NHL's leading scorer until he sprained his right ankle Jan. 18, missed his 23rd game in the Penguins' last 26. But with Malkin getting 17 goals and 23 assists, the Penguins are 13-6-4 without Crosby and are contending to win the conference for the first time since the 1992-93 season. Still, who could have imagined this? The Penguins' two highest-scoring games this season have come since Crosby had a recurrence of an injury that might sideline him another couple of games. Pittsburgh beat Buffalo 7-3 on Wednesday as seven players scored goals. Maybe the Flyers shouldn't have gotten Malkin mad while winning their first four against Pittsburgh. After Malkin had a goal and three assists during Pittsburgh's only other victory against the Flyers, on Feb. 10, he said, "I don't like that team" - in part because of the antagonism Philadelphia fans show the Penguins. They'll like him even less now. "He (Malkin) may be the best player in the league right now, and you have to respect that fact," Flyers coach John Stevens said, complaining about several defensive breakdowns that led to goals. Malkin, competing with Washington's Alex Ovechkin for the scoring title won last season by Crosby, has three goals and eight points in his last two games against the Flyers and nine goals and 13 assists in 13 career games against them. "I had a good game," Malkin said. "Hopefully, I'm going to keep getting points." Penguins goalie Marc-Andre Fleury stopped 24 shots and is 4-1-1 in his last six starts. Hossa's goal made it 5-1 in the second period and came 31 seconds after Malkin scored his second of the game and 41st of the season, long after the Penguins chased goalie Martin Biron by taking a 3-0 lead. Malkin scored on a backhander 4 1/2 minutes in and Sykora got his first about four minutes later. "We could see it from their bench, their players, as soon as it was 2-0, it zapped their energy," defenseman Brooks Orpik said. "Geno kind of, for whatever reason, seems to turn it up a notch when Sid's not in the lineup, I can't really explain why." The Flyers, the eighth-place team in the Eastern Conference, have lost four in a row (0-2-2) and six of eight (2-3-3). 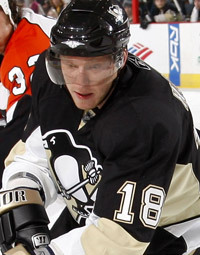 They pulled Biron after he gave up three goals on eight shots, with Malkin, Sykora and rookie Tyler Kennedy scoring. Biron wasn't happy with his play, or being lifted, saying, "When you get taken out of a game where your playoff life is on the line, you're never happy about it." There wasn't much for the Flyers to like against a team they beat 8-2 on Dec. 11. "It's in our hands right now," Mike Richards said. "It's better to be in this situation than to be chasing from behind. We control our destiny, but we better start winning games and playing a whole lot better." Notes: Crosby has played in 49 games, yet last season's NHL scoring champion has tumbled to fifth on the club with 22 goals. He trails Malkin (41), Hossa (27), Sykora (25) and Malone (24). ... The Flyers were without D Derian Hatcher, who may miss the rest of the season with an injured right leg. They got more bad news as C R.J. Umberger, who has six of his 12 goals this season against hometown Pittsburgh, sprained his left knee and sat out all but 7 1/2 minutes Sunday. He could be out as long as two weeks.